This Indoor Siren brings more safety into your home: Thanks to its audible and visual alarm, it reliably informs all people in the smart home in the event of danger such as fire and can be used as an alarm system in combination with door/window sensors at the same time. The Indoor Siren warns of a 105 dB loud audible signal and a flashing LED signal in case of danger in the smart home. The siren can be configured to fire either only one optical signal or just the siren or both on alarm. The siren alerts in real time about a burglary, fire or the trigger of other alarm sensors. 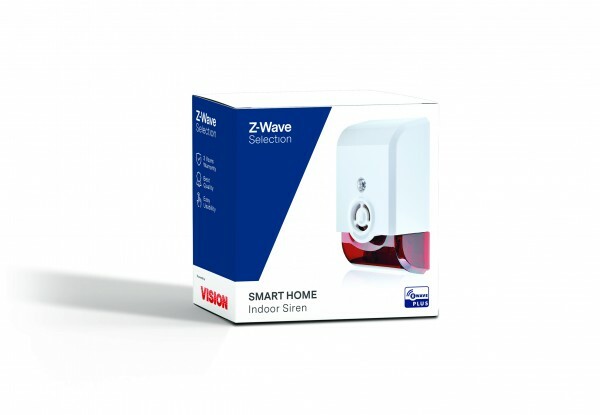 The Indoor Siren can be mounted anywhere in your home and is wirelessly triggered via Z-Wave technology. In addition, the siren has a tamper protection, which protects the device against unauthorized access. It is powered by batteries, making it easy to install without the need for additional cables. The siren has a bracket for wall mounting. If the device is removed from the holder unauthorized, the manipulation contact triggers the alarm siren. In the event of danger, the alarm sounds: No matter if it is fire, burglary or flooding. No matter what time of day or wherever you are, with the indoor siren your home becomes a safer place for all residents. Related links to "Indoor Siren"